Did you know that when you upload a video to YouTube, closed captions are added for you automatically after a few minutes? The captions are surprisingly accurate. 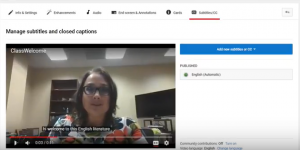 You can also go in and edit the captions, adding punctuation and capitalization or making other changes. Watch this short video (7 minutes) to see how easy it is!